Relaxed working with paperless meetings within your existing Microsoft Office 365 environment with Easy2Meet. More time, control, overview and job satisfaction. What are paperless meetings not? Paperless meetings encompass more than attending meetings through your laptop or tablet. The term ‘paperless’ is therefore not comprehensive. Paperless meetings are merely the most visible change as compared to traditional meetings. People who switch to paperless meetings especially notice how smoothly meetings run. The meeting software for this way of meeting has been designed with the sole purpose of facilitating meetings. You experience this as a user; meetings run more efficiently and there is a lot more overview during the entire process. How does the meeting software facilitate smooth meetings? Paperless meetings are a way of meeting which is fully facilitated by an app or meeting software package. At the start of the meeting everyone opens the meeting tool on a tablet, laptop or phone. That way everyone has the correct documents and the meeting can start right away. It is easy to edit documents within the software or app. For example, making notes or annotations and the possibility to shade text sections. The possibilities depend on the package or app. The intention is that you work like you did before on paper but with the benefits of working digitally. Like, for example, being able to access your edited documents anytime, anywhere and to easily share them. By working with this meeting software specially which has been designed for this purpose the preparation of a meeting takes (a lot) less time. With just a few clicks you add documents to a planned meeting. Subsequent modifications are done in a flash. In some cases the preparation time drops from a few hours to a few seconds per meeting. In addition, working within a fixed structure offers tremendous overview. Documents are easy to find and share; the entire history surrounding the decision process is recorded. This also applies to the minutes and any possible notes. The functionalities offered and the amount of user friendliness depend on the provider. 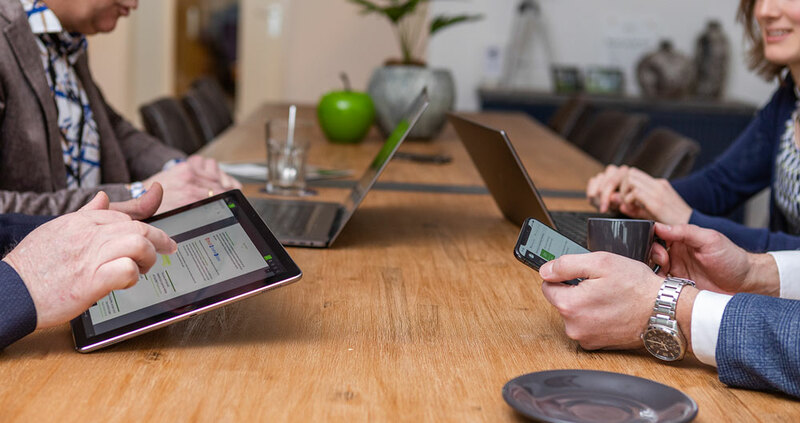 What does it bring according to people already working with paperless meetings? structure resulting in process control. It’s easy and even free to switch to paperless meetings. The free means used to this end are, for example, Dropbox, OneNote and Microsoft Teams. These means have not been primarily designed for the meeting process and therefore lack the necessary structure and meeting functionality. Well known pay providers of meeting software are iBabs, Diligent Board, OurMeeting, Petear, Arrix and Easy2Meet. Seeing the big differences in price, functionality, but also int the way of integration in the existing IT environment there’s no such thing as a ‘best choice’. It depends on the company or institution what the right software is. There are various software packages and apps which facilitate this way of meeting. The measure of security depends on the provider. It varies from sufficient basic security to warrant privacy to a high degree of security. Read about an Easy2Meet blog about security here. Why do organisations opt to switch to paperless meetings? Preparing (board) meetings is a weekly recurring, time consuming task for secretaries. The meeting documents are often large documents which have to be printed and sent to the participants. By doing so, the organisation uses a lot of paper. Meetings are disorganized and do not always start on time, for example because not everyone has the right (version of the) meeting papers or because there is confusion about the documents. This takes time and significantly lessens job satisfaction. Everyone has his own way of working and documenting. Searching for documents happens on a frequent basis. Are they documented in an e-mail? Or in a folder? And, if so, which folder? At night you want to reread the notes you’ve taken during an important meeting. Unfortunately you’ve left these at the office and they are therefore inaccessible to you. Above mentioned problems are solved when you switch to paperless meetings. The switch to paperless meetings doesn’t have to be complicated, time consuming or expensive. How the implementation will go depends on the chosen software and on how your organisation is set up right now. Which software do you have now? Is it compatible? 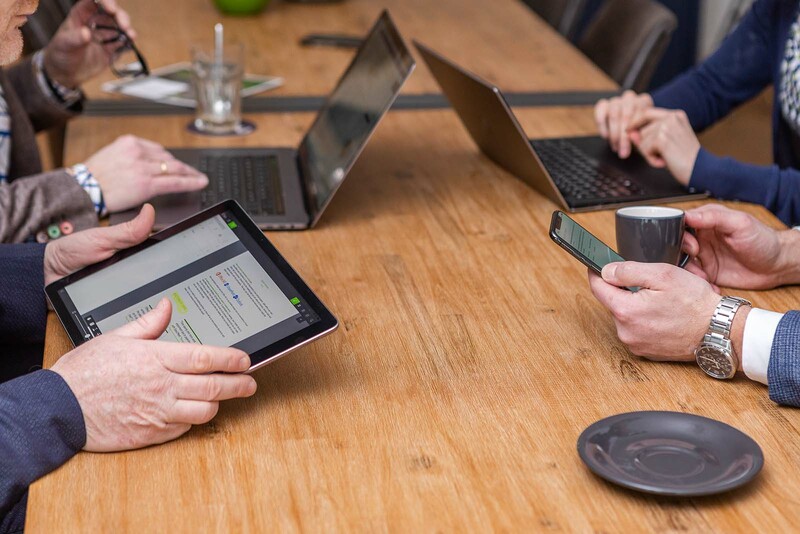 In this reference case you’ll find a great example of how the technological implementation of paperless meetings can be a smooth 30-minute process – easy-peasy access. Which problem do I want to solve within my organisation? Which product matches this? How is the existing IT environment set up? Which software is compatible? Is the software within my budget? And what does this way of working bring my organisation? How user friendly is the software? What about the implementation process within IT and within the organisation? Is it possible to work from any (working) place and on any device (phone, laptop, tablet)? Will I be able to manage my own data? Is it possible to easily and efficiently switch to different software?